This is our first time to stay at The Oasia Hotel Novena after staying at Oasia Hotel Downtown for several times. We are able to take MRT from Changi Airport to Novena station and is accessible from one of the MRT exit to hotel lobby without going outsides. We always stay at the Club floor of Oasia Hotel as it provides much more benefits and personal privacy during our stay. We are happy that we may enjoy exclusive facilities and services with comfortable stay experience. There are shopping arcade, foot court and a catholic church around Novena. 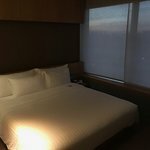 We stayed for 4 nights while In Singapore and found the hotel to be ok. We were disappointed that weâ€™d booked a king size bed, however on check in this was not available so we had to chose between twin beds or a double. We chose the double and it seemed really small! The room itself was fairly small but modern, although it looked a bit scruffy with the furniture peeling and mould on the sink grouting. It would have been helpful to have drawers as there was only a wardrobe which isnt enough storage for 2 people. It would make the cleaners job easier too if everything can be tidied away. The sink really struggled to drain, not sure if it was blocked or just poor plumbing. There was no plugs near the mirror which made it really difficult to do my hair, i ended up using the camera on my phone in selfie mode and propping it up as a mirror! Very annoying but something so easily rectified. Just a small mirror on the desk near the plugs would do the job. The air con wasnâ€™t very good so we kept the blinds down in the day to keep the room cool. The pool area is lovely with plenty of really comfy loungers and nice towels. The gym is small but theres one of each machine and two treadmills. The air con in there is also rubbish. Location was ideal for us, not much around, but theres direct access to the Novena MRT station via the lifts and you can get everywhere using the MRT. A small issue which I had with the TV experience which was not exactly pleasant, with the constant Samsung menu/advertisement popping up, blocking about 1/4 of the screen and the subtitles. Other than that, I have nothing else to nitpick at. We love Oasis Hotel for first read all the review. Most of the stacf helpd full from the check in process. Large room,planty of choice at restaurant,location a right to get around. I stayed 5 days in the hotel. I was leading a 3-day-meeting for about 25 employees from our company. Meeting: the location was perfect. Technical equipment was very good and the support we got during the 3 days could not be better. Teabreaks and lunch was well organized and tasted good. Lounge: a very nice place to meet with colleagues after meetings to have a couple of drinks. Amazing pool with view to Singapore. Staff was super friendly and helpful. Room: unfortunately this is the bad side of the hotel. The rooms are ok for a couple of days if you do not stay with your wife. Rooms are small and have very basic furnishing. Furniture is quite aged. Also for travelers the rooms are too small in case you have some luggage with you. Nothing that would make you feel like home.